Attorney Josh Rohrscheib is a personal injury lawyer who cares about every client he represents. If you have experienced an accident, a personal injury lawyer can help you to navigate the legal process and get a fair settlement. While you can work with an insurance company directly and file a court case on your own (pro se), your chances of getting the settlement you deserve are greater with the help of a personal injury attorney. 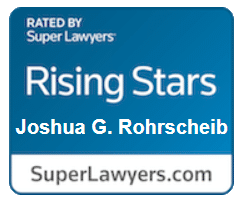 Josh Rohrscheib is one of the Super Lawyers Rising Stars personal injury attorneys who serves Bloomington IL. How do I get started with hiring a personal injury attorney in Bloomington Illinois? If you’re looking for a lawyer for a car accident or another injury case, Josh would be happy to talk to you, free of charge, to discuss your case and help you determine if you want to hire a lawyer and who might be a good fit for your case. Josh Rohrscheib can provide you with legal representation in a personal injury claim in or around Bloomington, McLean County, Illinois. Contact Josh for a free case evaluation today.